Amazingly Big Sound, Surprisingly Small Size! With a stylish, space-saving design that fits anywhere in your home, this MusicCast speaker lets you stream music wirelessly using your existing Wi-Fi network. Use it as a stand-alone streaming music speaker or add other MusicCast products over time and control them all with a simple app. Two units can be used in stereo mode for a more expansive and lifelike listening experience. *This model will NOT work as rear surround speakers on select Yamaha receivers. MusicCast makes it easy to bring music to every room in your home wirelessly with playback controlled by a simple app. Start with a single MusicCast wireless speaker, then add more throughout the house. Next add a MusicCast-capable AV receiver in your main entertainment room for the ultimate home theater experience, then add sound bars or Hi-Fi components in other rooms wirelessly. With a two-way speaker design plus two passive radiators, this speaker will surprise you by how well it fills a room with robust, dynamic sound, despite its compact size. It also supports playback of high-resolution audio formats such as WAV, FLAC and ALAC. The small footprint of this speaker makes it perfect for use in the kitchen, bedside or anywhere space is limited. You can even mount it on a wall with commercially available speaker mounts using the integrated 1/4"-20 threaded mounting hole. MusicCast allows you to access your digital music library, streaming music services, Internet radio and Bluetooth® wireless technology sources. 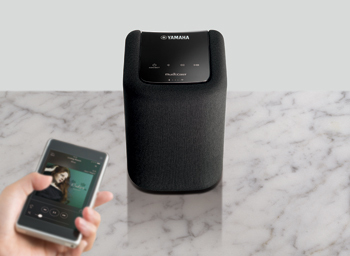 Stream music directly from your smartphone or tablet via Bluetooth wireless technology or AirPlay®. 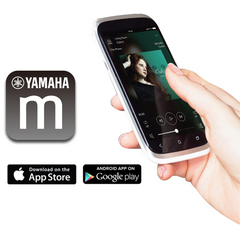 Use the MusicCast Controller app to pause/play and adjust the volume from your handheld device. The WX-010 is equipped with the latest Bluetooth wireless technology, making wireless operation more convenient than ever. With Bluetooth, stream music from the WX-010 to headphones, for private listening, or to speakers. Two WX-010 units can be paired via the MusicCast Controller app to function as left and right channel speakers, providing stereo sound for a wider listening area. The free MusicCast Controller app puts control of your wireless speaker in the palm of your hand. Use the MusicCast Controller app to operate the speaker and change settings, select your source and control music playback. By using the MusicCast App EQ setting, you can perform sound tuning to optimize the source you are listening to or to match your own preferences. You can set the levels of High, Mid and Low audio bands individually. Yamaha, like all electronics manufactures, receives products returned for various reasons. In 2011 consumers returned 17 billion dollars in electronics globally, of which less than 5% were found to be defective! Once a product has been opened it must be resold as refurbished and can’t be resold as new again. The history and reason why a product was returned is not provided to us, thus we can’t provide any additional details regarding its past. All products are processed by Yamaha certified technicians, where they are fully tested, repaired (only if necessary), and retested again to ensure the highest quality control. Each unit must pass a complete battery of test before it can be titled a "Yamaha Factory Refurbished" product.